Current Issue: Review 81, guest-edited by Lorna Goodison (From Harvey River) and Christopher Winks (Queens Colleges, CUNY), is comprised of a creative section featuring texts by associates of Bob Marley as well as writers who have written on and/or been influenced by him, including Jacqueline Bishop, Chris Blackwell, Kwame Dawes, Christopher John Farley, Herbie Miller, Shara McCallum, and Klive Walker. 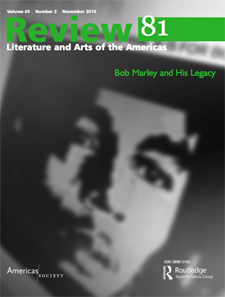 An academic section showcases articles on a breadth of topics relating to Bob Marley by Caribbean scholars Nadi Edwards, Robert Hill, Hugh Hodges, and Michelle Stephens. The issue also features arts pieces, memorial essays, and book reviews of recent titles by Caribbean and Latin American writers. Learn more or purchase Review 81. Subscribe to the magazine.